Naming conventions are rarely dull in the world of Linux distributions, and Ubuntu Linux is no exception. “Warty Warthog” started it all off, of course. Now, with recent examples including “Natty Narwhal” (Ubuntu 11.04), “Oneiric Ocelot” (Ubuntu 11.10), and “Precise Pangolin” (version 12.04), the question on many fans' minds has been what the nickname will be for Ubuntu 12.10, which will debut this fall. It will begin with the letter “Q,” clearly, and on Monday, Canonical founder Mark Shuttleworth revealed the answer at last: Quantal Quetzal. In the cloud, meanwhile, a new virtualized network called Quantum will make its debut with this upcoming release, Shuttleworth added. 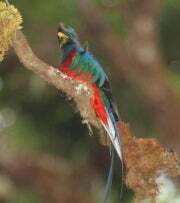 In creating Quantal Quetzal--named after the brightly colored bird in the trogon family--the Ubuntu team will keep many of the “quality-oriented practices” it used in the creation of the soon-to-launch Ubuntu 12.04 LTS, Shuttleworth said. “We’ll keep the platform usable throughout the cycle, because that helped hugely to encourage daily use of the release, which in turn gives us much better feedback on questions of quality,” he explained. At the same time, though, there will be a heightened focus on continuous integration, smoke testing, and automated benchmarking of the release, he explained. As for rumors that Ubuntu might switch from Upstart to SystemD, they're unfounded, Shuttleworth wrote. “After a review by the Ubuntu Foundations team, our course is clear: we’re committed to Upstart,” he said. Among the style changes to come, meanwhile, will be tweaks to typography and iconography, including a newly refined look for apps and interfaces throughout the platform. Of course, work may just be beginning on Ubuntu 12.10, but version 12.04, or “Precise Pangolin,” is due on Thursday. Stay tuned for more updates as that day approaches.